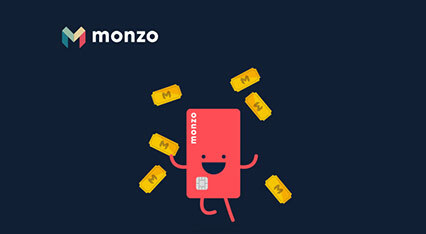 Get £5 credit when you open a Monzo account with our refer a friend code / link. To see the deal, you should click on the ´Get Deal´ button on the right side of the screen. Enter your email and click on ´Get Started´. To get a £5 Golden Ticket, you must first open an account. To open the account, you´ll need the Monzo app. You can download it on the AppStore or get it on Google Play. Once you instal the app on your smartphone, open it, and click on ´Find Out More´. You can choose ´Next´, to learn more about Monzo, or you can click on ´Create an Account´. First, you´ll be asked to enter your email. You must register with the same email you´ve just used. Enter your email address, click ´Continue´, and check your email for a login link. Open the link with your Monzo app, and enter your personal information to create an account. As soon as you spend some money with your card, you´ll get a £5 credited to your account! Monzo is the future of banking. It´s a digital bank founded in 2015, and based in the UK. It operates through mobile apps for both iOS and Android. With Monzo, you can manage your money easily - set spending budgets, pay people in seconds, manage recurring payments, and more.